Although Christmas Day might be the highlight of the holiday season for many Americans, the people of Puerto Rico complete their Christmas Season marathon with the celebration of the Three Kings, or Los Reyes Magos, a spiritual and faith-filled representation of the birth of Christ that leaves Santa Claus behind in favor of parades and festivals honoring the Three Wise Men of biblical lore. If you're planning to travel to Puerto Rico, especially Old San Juan, for the holiday season, consider moving your trip to January so you can take part in this great cultural celebration that's shared by a majority of the Latin world. Read on to learn more about Three Kings Day, also known as Epiphany, which is when Puerto Ricans (and large swaths of the Latin world) exchange gifts, gather together with their loved ones, and celebrate the birth of Christ and the men who helped him enter the world. Regardless of faith, most Americans know the story, or at least, know of the story, of the Three Kings. However, as the Christianity Guide Mary Fairchild explains, we don't know a whole lot about the Magi—in their sole appearance in the Gospel of Matthew, they are never named, and hail from "the east." The names we have since come to know them by—Gaspar, Melchior, and Balthasar—were handed to them much later on in biblical history. However, the most well-known thing about them, of course, is that they came bearing gifts: gold, frankincense, and myrrh. On the night Christ was born, they were drawn by a "mysterious light," which became a star that hung in the western sky, and followed this sign to Bethlehem, where they arrived (a little late) to honor Christ's birth, and because these men arrived late, the "12 Days of Christmas," which is so often believed to end on December 25, actually begins on the 25th and runs through January 6, culminating with the Feast of Epiphany, or "The Adoration of the Magi." Three Kings Day, or Epiphany, is one of the most important holidays on the Puerto Rican calendar. Traditionally, the island, and most of the Latin world, marked the eve of January 6 as the day to exchange presents rather than December 25, and kids would gather grass, hay, or straw in shoe-boxes for the Magi's horses or camels—a charming alternative to cookies and milk for Santa. Traditionally, good kids were rewarded with presents and candy on Three Kings Day, while bad kids ended up with charcoal or even dirt, but today children typically get their main presents on Christmas Day but always get a smaller, humbler, or perhaps even more rewarding gift reserved for Epiphany. The Three Kings are also a mainstay of Puerto Rican arts and crafts as they are among the most popular subjects for the island's santos, or handmade figurines of saints and other religious persons, and practically every souvenir shop worth its salt will carry some homage to them; traditionally, you'll find carvings and artwork of the three kings on horses instead of camels because the country folk in years past didn't know what a camel was. On Three Kings Day, expect parades and festivals and a time of family gatherings and parties with a more spiritual focus. 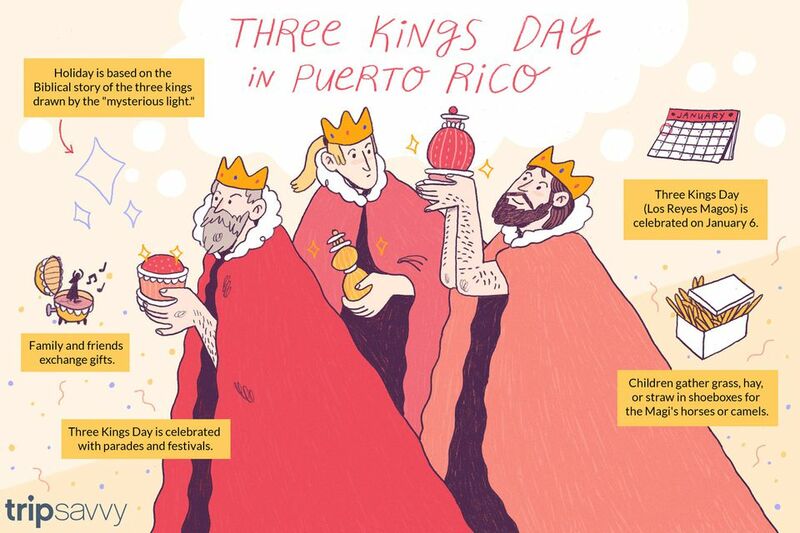 Old San Juan throws an annual festival at the Luis Muñoz Marín Park with live music, food and drink, and free gifts given out to lucky kids, but the highlight of the day occurs when the Three Kings come walking into town. These particular Puerto Rican kings hail from Juana Díaz, a town in the south of the island that is the unofficial hometown of the Magi—a statue of the kings greets you when you enter the town, and also adorns the main plaza—and from this base, the Three Kings travel around the island, but their stop in Old San Juan is the largest of the island's celebrations.